When Lucy and Johnny run away from a small country town, they had a simple plan - Move to London to start a new life together. Johnny is a musician who wants to get his music career kick-started, and Lucy wants to create a whole new life for herself. What they find however, they could never have expected in a million years. After being tuned from numerous full bed and breakfasts, hotels and hostels, they stumble across an old run-down hotel in a bad part of town. They think their luck has finally changed, but not the way that they think. The eerie landlady Ivana has other plans for the pair, particularly susceptible Lucy. 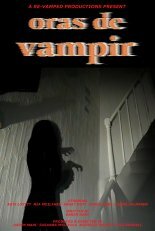 What follows is a battle between good and evil, and their very lives in this City Of Vampires. This project was filmed as part of a practical assignment in a film studies module at University. The brief was simply to create a short film in a number of given genres. The group decided on a vampire horror film. So ideas were generated and the film was written and planned. The film was shot over a period of a few weeks, completely on location in Pekham, East London, then finally edited together using editing equipment at the University. The final edit was transferred to black and white and colour tinted to re-create an old movie look. A Finnish rock band called Damage provided us with the soundtrack, creating a surreal version of a vampire film. The film runs for about 12 mins and is a good example of what is possible with limited resources and money. Special thanks to Kati Loytty, Mia Moilanen, Hanne Salminen, Michelle Martin, Susanna Myllyoja, Lisa Randall, Sanat Dutt & Damage.